My buddy Adrian and I ran our Magnesia game using WAB 2.0 rules this morning. We had play-tested this game over a month ago, and didn't have time to do another one, but it went off fine - I think. We called the game at the end of Turn 5; we all agreed it was likely a Seleucid victory. The Roman Army General was killed in Turn 3 and this pretty much caused a chain reaction down the line with most of the Roman units failing their Leadership Test. Antiochus and his Companion wedge pretty much sat out the battle. This is totally the opposite of what he did historically - which was lead the charge well into the enemy and losing contact with this infantry. Bob Hathaway (aka Old Bob on TMP) from Oregon was gracious enough to bring up an Aventine Tarentine cav unit for the Roman's right flank. Adrian had a unit of Relic Tarentines, but developed painter's block. Everyone had a great time and I'd say I'm far from looking for a new set of Ancients rules. I may post nicer photos once Adrian posts the ones he took - I was busy discussing the finer points of the game with not only the players but Mike Evans of Relic Miniatures who drove down from Vancouver, B.C. He's a great guy and brought some new figures he's working on for us to comment on - he also gave us some free figures. What a great guy! Two days down, one more to go. Tomorrow my buddy Adrian & I will be hosting our Battle of Magnesia game using WAB 2.0 rules. Friday I hosted a reprise of the Ichi no Tani samurai skirmish game that I ran last summer at Fix Bayonets! The rules are modified WAB rules that are really simple and fast playing - which all the players so far said they enjoyed. I've run this game three times so far, and every time the outcome has been totally different. This time the Minamoto attackers along the shoreline chose to disregard the Taira camp entirely and focus on burning their boats. This they accomplished, but later lost both their heroes (Yoshitsune & Benkei), as wells as both of their standards. The Taira won the battle, but couldn't escape out to sea - but I guess that became a moot point. Friday evening I got to play in Mike Garcia's super cool Ice Age Hunting game. I managed to bag a load of edible beasts, at the cost of losing most of my hunting party. Saturday morning had me participating in a huge Roman versus Ancient Germans in the Teutoberg Forest. This impressive game was hosted by the White Rock Gamers from Vancouver, B.C. The rules were a modified (simplified) version of ARMATI 2nd ed. First time I had ever played these Ancients rules. At the end of the game, all of the gamers were presented a large color poster of the game flyer - class act those White Rockers! Saturday afternoon, I got into one of Eric Hotz' always enjoyable Roman Seas games. I now feel like I erred in selling off the fleets I had built last year. Although I did pick up a packet of Valiant 1/900th scale pentekontors. I scored some pretty good stuff from the Bring & Buy tables - one goodie is an OG Napoleonic Limber set which I got for $10.00. I also sold off some stuff that was only collecting dust. There have been a lot of great looking games going on so far. I only managed to take a few photos being engaged in games the whole time though. Here are just a few of them - hopefully captioned correctly. aka Turkish Crescent finished. The bearer of the device is a Mameluke. Again, these are Front Rank figures which are nicely sculpted with good details. Below is a depiction of the 88th Foot (Connaught Rangers) capturing the Jingling Johnny belonging to the French 101st Line at Salamanca in 1812. Apparently many European armies used these in their bands, but only a few still use them in the present-day. 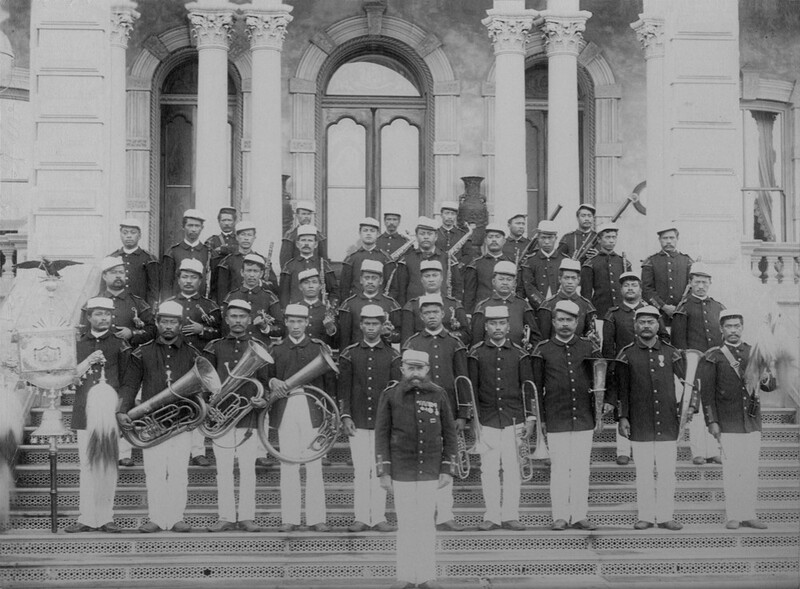 Interestingly enough, German Emperor William I presented one to King Kalakaua of Hawaii in 1881, when the later toured the world. 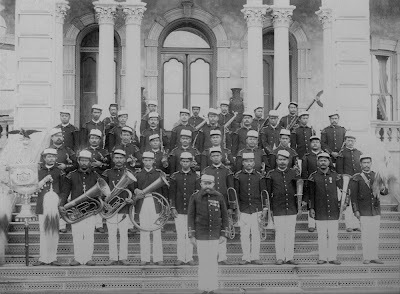 It was used in the Royal Hawaiian Band - pictured far left in photo below. Next weekend is the big Pacific Northwest historical gaming convention - Enfilade! I will host/co-host a couple of games; one on Friday and one on Sunday. I should also be pre-registered for two Ancient Naval games on Saturday; one Roman Seas and the other Man Your Oars! I like Roman Seas (and have the rules), but want to see how the other set compares. Hope to post some photos and AARs after the convention. Decided to paint a few French Napoleonic figures by Front Rank. Finished two of them, a drum major and a Guard Foot Artillery officer. Still need to paint the Jingling Johnny Mameluke. The drum major is based on descriptions of several examples from Light Infantry regiments prior to Napoleon ordering all musicians to wear Imperial Livery colors. I like Front Rank and will likely be getting more someday. These were ordered some time ago along with their Spanish Guerrillas. They might appear a bit bulky in photos but I think they actually go well together on the table with both Victrix and Perry. As far as gaming plans go, there was a last call for more games at Enfilade! later this month. I stepped up and committed to hosting a reprise of the Samurai Skirmish game that was played last summer at Fix Bayonets! My buddy and I are also still hosting the Magnesia game using WAB 2.0 rules. All the gear is packed and ready to roll - as well as some items I hope to sell at the Bring & Buy tables. 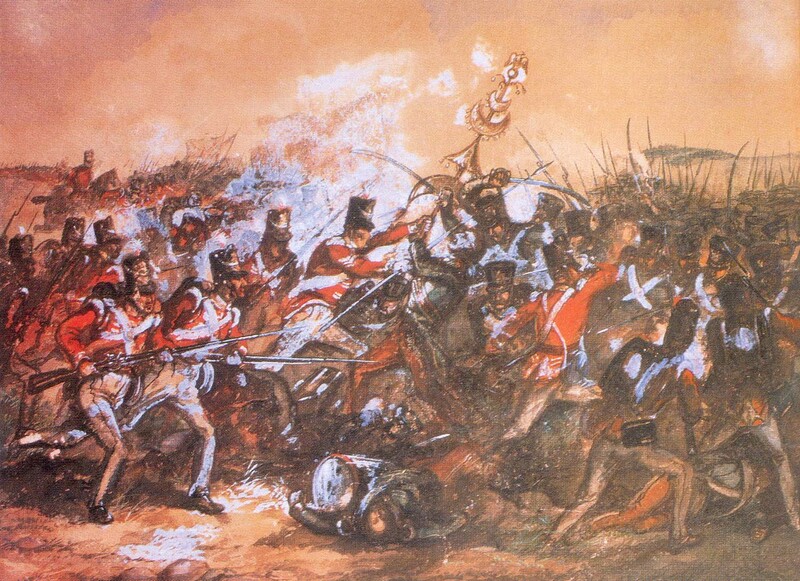 These 12 will join the earlier completed 36-man unit of 42nd Highlanders. Initially I had only wanted mostly marching poses, but these can be used in skirmish scenarios using Sharp Practice. Bought this figure off of ebay the other day. Figured he could be part of the Battle Standard wagon for the Early-HRE army. He's from Gamezone Miniatures from their Empire range. I'm not familiar with either the maker nor the range, but he looks appropriate. He painted up quickly as only a few colors are used. Here he is in front of the wagon. Mounted on a 20mm fender washer, he just squeezes inside the wagon. Here's a method that is fairly quick & easy to address the Highlanders' stocking & garter. It works for the way they're sculpted on Victrix models. Only a minimum of the stocking is exposed between the garter and the gaiters. All you have to do is paint the garter red and the top of the exposed stocking white. With a black base coat, you can leave parts of it for black lining. On the white portion of the stocking paint evenly-spaced pink cross-hatching to replicate the checkered pattern of the stockings. Beneath the garter, there is so little stocking exposed that just black lining is left between it and the gaiters. You can paint the gaiter buttons a metal color, but I just dry-brush the entire area with a lighter grey - this picks out the buttons enough for me. This method obviously won't work for stockings that are more exposed - or for those without gaiters (like pre-Napoleonics). So far - dry-brushed the bonnet feathers; dry-brushed the canteens a light greyish blue; and painted the hackles to represent line, lights and grenadiers. Also painted the white straps & collar & cuff lacing. This is somewhat contrary to the way I usually paint clothing. That is, I would normally paint the basic coat color and then paint the items that go over it. However, in this case, with the black base coat it actually seems to work better this way.